The trend followers globally took a breath of fresh air as the news surfaced about Facebook rolling out a “Trending News” section on mobile that is also going to include its own link to the app’s main navigation. This follows the earlier announcement this spring of a redesign of trending topics which is apparently an essential part of Facebook’s social network. It tracks the new stories that are creating the buzz across the service. This news section is being rolled out for users of both iOS and Android apps used in the United States. The added navigational link to the news that is trending became visible to iPhone users a few weeks ago and for Android users, it’s still in the testing phase. The trending topic was redesigned with a keen focus on making it easier to see how other publications are covering a topic other than what people are talking about it, was made clear in another announcement made by Facebook earlier in May 2017. So, now as you click on a trending topic, you will see a carousel of stories from various other publications that you are able to swipe and view. The publications that show in this section are determined by the level of engagement they are creating on Facebook, both around the article itself and the publisher as well as the other articles that are linking to it. This card styled carousel look and feel is inspired partly by Facebook Paper; the company’s standalone news reading app. This carousel is still in the rolling out process in the United States. 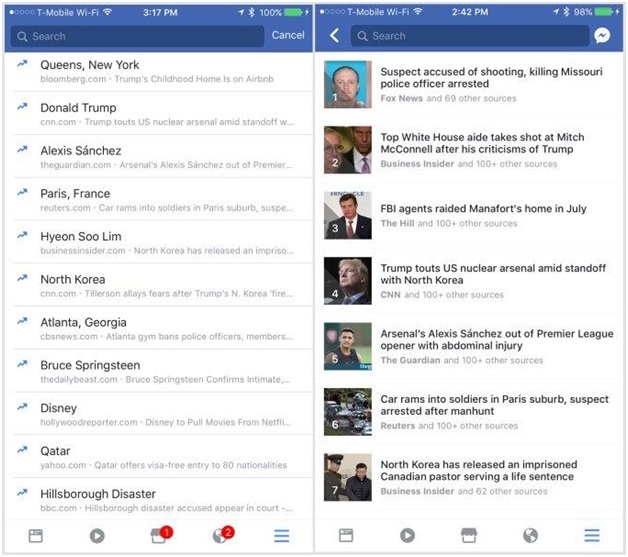 Another aspect of trending makeover that wasn’t really touched earlier on Facebook’s announcement was how the social network is playing with a redesigned list of news stories that focus on headlines and not just trending topics alone. The original look of the Facebook’s trending topic that the users pull up with a tap on the app search box, is a simple list of topics and begins like a list that cuts off later. These trending topics will appear in your own recent searches on Facebook. 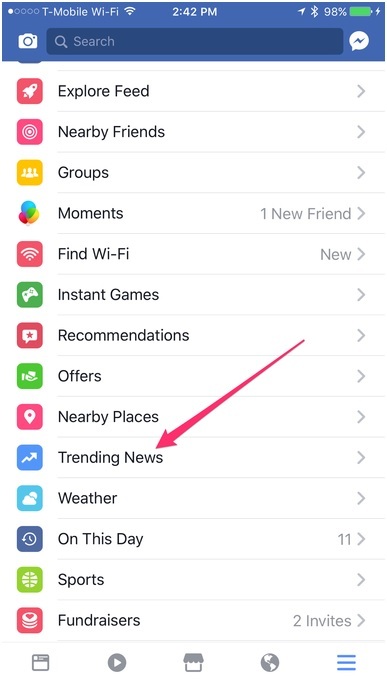 However, if you are willing to access the trending news link that just popped up in Facebook’s navigation menu, you are going to see an entirely different trending section from the one discussed earlier. Facebook said earlier that it was testing a new interface that will add top three Trending News to the users’ news feed. 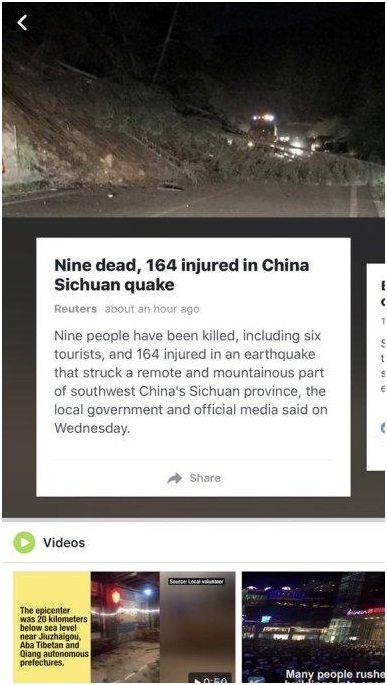 In the screenshot, you were able to see the numbers of stories along with their photos which were ranked the highest in terms of numbers and engagement they have generated. These stories were identified by Headlines, instead of just topics. This integration of a “mini” Trending News section into News Feed is not broadly available. That remains a “small test,” we understand. But the addition of the Trending News link to Facebook’s navigation is already live on iPhone, and being trialed on Android. Of course, any changes Facebook makes to Trending are sure to meet a lot of scrutinies. The company last year faced criticism when it removed its human editors who curated this section, to run Trending by way of algorithms instead. (And those algorithms soon screwed up.) The social network has more recently made several changes to address the spread of fake news and filter bubbles, as well. In this case, though, Facebook is not monkeying with how news is selected as “Trending,” only how it’s being displayed. The new Trending News section joins a number of other new additions to Facebook’s main navigation as of late, including the food ordering option, Town Hall, weather, the Explore feed, and more. Not all these additions have stuck around – the new travel-focused City Guides section, for instance, has since disappeared. So, this was the wrap of the trending news section with its link that is soon going to surface on the famous social media. for more trending tech-news, please keep reading our blog and don’t forget to subscribe for oven hot technology news that we bring to you as soon as its cooked. Read The Good News That Snap Inc. Is So Excited About? Facebook Badges – Let your Politicians Know Who You Are?